Got a bunch of favorite recipes from family and friends bulging out of a box or drawer in your kitchen? Clear out that clutter—all of those and more can be found in The Old Farmer's Almanac Everyday Cookbook,, in a neat and organized fashion, with more than 180 time-saving tips to boot! 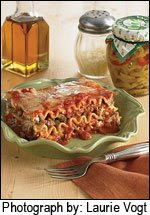 One of these recipes, Mild and Meaty Lasagna, is shown below. A favorite on Christmas Eve and at family gatherings, this can be made the day before, refrigerated, and brought to room temperature before baking. In a large frying pan, sauté the beef and pork with the onion, garlic, spices, and garlic salt. Use a fork to crumble the meats as they brown. Drain and set aside. Rinse the lasagna noodles and put them into a pan of cold water. Reserve one-quarter of the mozzarella and Parmesan cheeses. In the bottom of a lasagna pan or large baking pan, place three lasagna noodles side by side. Begin the assembly: Over the noodles, spread one-third of the meat mixture; on top of that, spread one-third of the remaining mozzarella and Parmesan and one-third of the ricotta; and on top of that, spread one-third of the sauce. Repeat two times, ending with sauce to cover completely. Sprinkle the reserved mozzarella and Parmesan on top. Place a loose foil tent over the lasagna and bake for 40 minutes. Remove the foil tent and continue baking until the cheese on top is slightly browned, about 20 minutes more. Makes 12 to 15 servings.